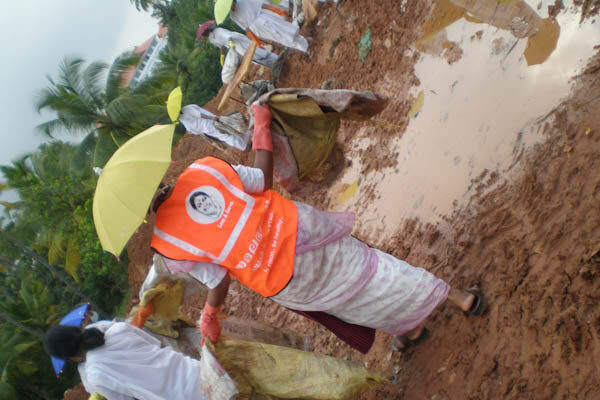 Amma’s Amala Bharatam Campaign (ABC) is nothing short of a total revolution. 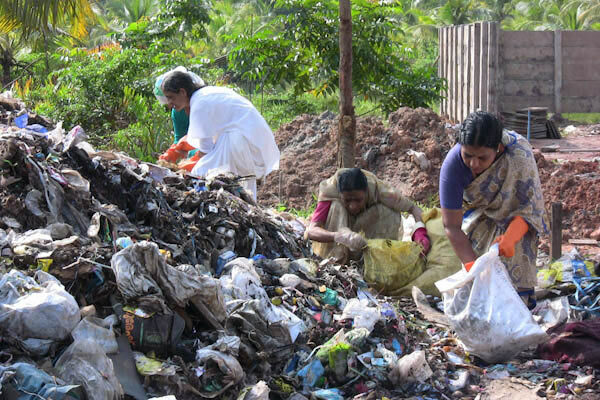 For those directly participating in ABC activity, it is indeed an elevating experience to gather waste from the wayside and later sort it in order to dispose off. 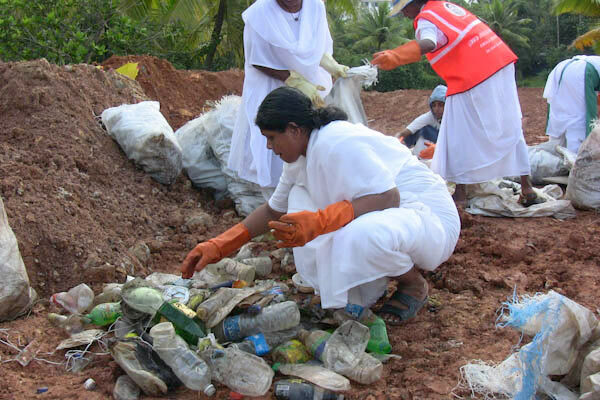 It is Amma’s direct instruction for us to make India clean and beautiful. It is Her birthday dream, and it is a birthday gift that we can offer Her. 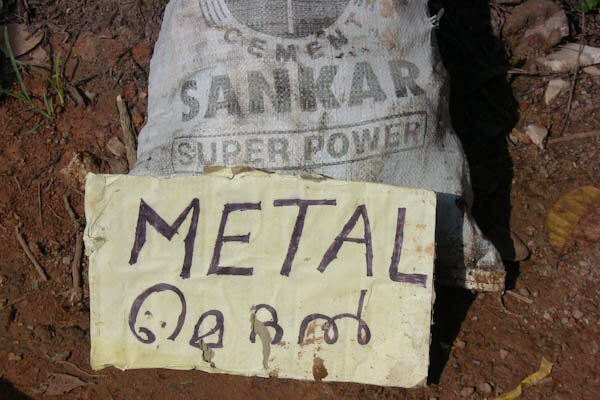 Waste from the road side means a lot more than just ‘useless things’ for regular Indians. It has social ramifications, association with caste practices, economical implications and what not, all pointing to lowliness, ugliness, menial-ness, repulsiveness and such. Just the mention of it can cause allergy for many. Rashes on the skin, series of sneezes, asthma, etc. Some even fear diseases, not realizing the truth that cleanliness can cure as well as prevent diseases. None of them were deterrents for Amma’s children. All over the world this garbage management is causing terrible problems at micro and macro levels. Everyone would want to throw, throw out of the window, throw into street corner bins, dump in city outskirts or rivers and lakes etc. And now countries dump mountains of garbage into the sea. Alas, after that is done, would mankind think of spilling it out into outer space! Here in Amritapuri, every day is Diwali in its real sense. Diwali is a festival of lights, which for a spiritual aspirant, removes the darkness of ignorance. The day began with the regular Archana, followed by the scriptural class by Swami Kaivalyanandaji. It was Mundakopanishad, last verse of Part One which speaks of the all pervading-ness of Brahman. Brahman in the front, Brahman in the back… All that we perceive around us is the Ultimate Truth itself. 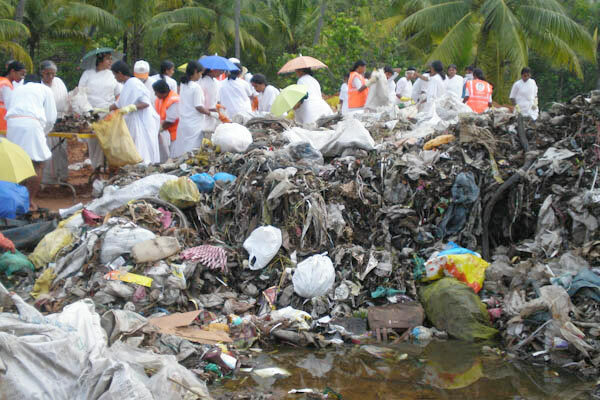 Then, soon after, we walked over to the University campus, where awaited a huge Brahman… a big pile of garbage collected from the main roads on Karunagapally, Vavakavu, Puthiyakavu, Oachira etc. Also were saks-ful of garbage lying in wait. Amma often calls from Europe and gives us step by step instruction on how to move things and sort things. Brahmacharinis set to work: they wore gloves, stuck the little umbrellas over their heads, tucked the saree ends and pleats, and approached the tables. One bag was emptied on one table at a time. Several pairs of hands dug into it to pick out things, which were then promptly filled into separate bags. Things like, well, you can’t see any ‘thing ‘in clear terms to call them ‘a pen’, ‘a bag,’ ‘a chappal’ ‘a pineapple top’ …. You could identify and classify them as hard plastic, soft plastic, rexin, thermocol, glass pieces, food waste, paper etc. So, the hands in gloves picked every bit from the stinking unpleasant array and did the sorting. This job is something that is not done by every day men/women or mainstream people. We may have seen rag pickers sitting among such garbage piles but they would pick for specific things, and not sort things for the sake of cleaning up. I don’t know if any person or group has done such a ‘pickup and hand sort ‘of rubbish. Sorting is just one word to say, but what a lot of work it is. Each and every one of those ‘things’ needs to be seen to its very end. (a spiritual precept on materials which materialist theories don’t think of.) We put all kinds of waste into our bins to keep our room tidy, and call it one word –trash. But that’s not the end of it. Rather that’s the beginning of the problem of waste management. Two days ago, the garbage from the Sunday collection occupied a vast area by the Amrita University Boy’s Hostel. The garbage included such rotten things that they were infested with worms. Obviously they were due to organic substance found in wastes from areas around hotels and hospitals. It was quite a job for the girls and ashram women (Indian and western) to sort things when worms were swarming, and dispose them in due manner. The decomposable, rather already decomposing, wastes were filled in pits dug for the purpose. 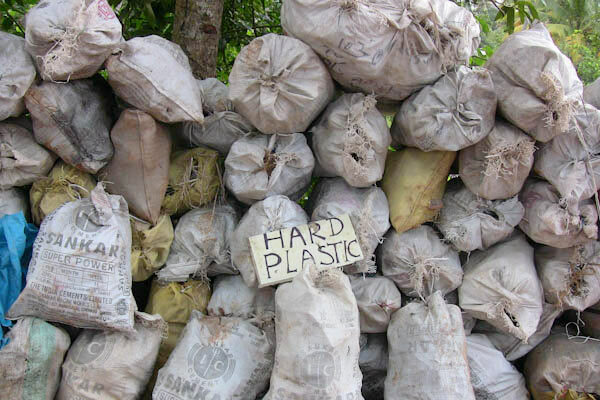 The recyclable wastes were put in bags and sent to respective places. The burnables were sent to be promptly burnt. 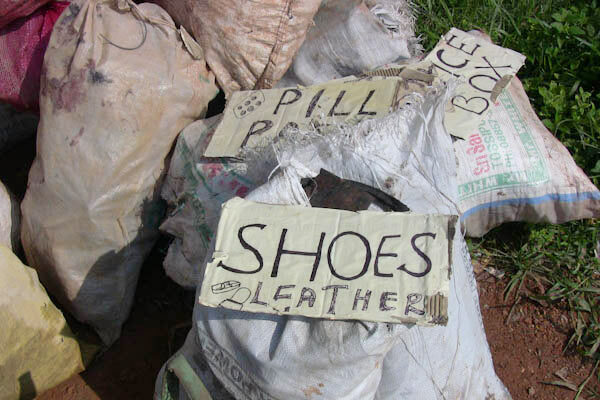 One can see how over production of things is one of the causes for waste production. For example, so many disposable plastic cups… (disposable paper cups would have become decomposed and would not be recognized at this stage.) Do we really need them in everyday lives? Emergencies can be exempted. So much of natural resources go into making them but their utility doesn’t justify the investment. This feels very unspiritual as it encourages use-and-throw culture. Amma constantly reminds us to do with the minimum whatever the things may be. That is the spiritual attitude that all of us, living on Nature’s mercy, require. On Diwali week when many mindlessly burn crackers polluting air with smoke, polluting sky with sound, polluting earth with the remains, Amma’s children in ABC would celebrate it with bringing light into their hearts. How neatly it coincided: the Upanishad teaching of the day and the work Amma sent us on. When we came back, not one of us had any misgivings, any unpleasantness. 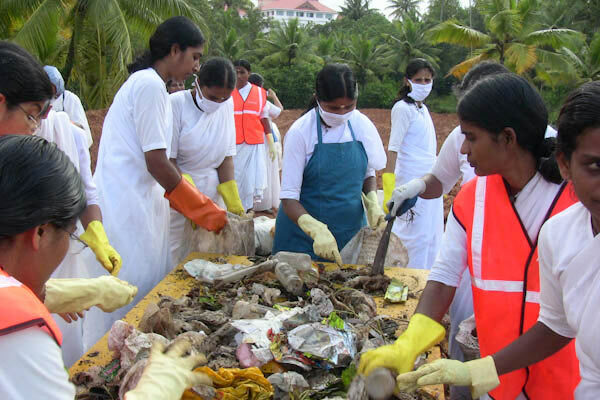 Thanks to the diligence that Amma has taught, there was not a stain of the garbage on the white sarees. Jobs were done; we are not the doers. On return, we bathed, did our laundry, and walked to our regular workplaces. One was saying, “Oh, my mind feels so different.. Its fresh and clear, like its after a rain.” Soon she remembered lessons on Karmayoga, that one of the benefits of Karmayoga is that it gets us chittashuddhi (purity of mind). It was so exhilarating for all of us around to see such high scriptural truths becoming real to us in our everyday experiences. Only Amma can think of such a wholesome revolution, which encompasses the ground realities of the material world and the great truths of the spiritual realm.